The IAABC Journal has just released an article reviewing Parelli natural horsemanship training methods. The conversations on social media in response to this post have been enlightening and have inspired me to put down some of my reflections on the issue. I come at the whole negative/positive reinforcement debate from a position of curiosity. As someone who wants to do well by my horses, I try to balance science and practice, and am also pragmatic. I’m not a horse trainer or professional behaviourist, I’m not perfect, and I make mistakes. However, I love Lucy Rees, ethology, and Rachael Draaisma​​‘s calming signals (which map really well with the polyvagal theory of understanding the nervous system’s hierarchical responses in mammals and the psychophysiology of stress and trauma — that’s my background as a human trauma therapist and Somatic Experiencing Practitioner). I understand dominance hierarchies are a myth and that captivity behaviours are a by-product of past or present conditions, resource guarding, stress, or trauma. I look for social / affiliative behaviours and track for fight / flight / freeze / faint / fawn in interactions, and monitor thresholds to prevent flooding. I try to foster consent, choice, voice, empowerment, trust and collaboration where reasonably possible. I track my own nervous system and attachment responses in relationships with people and animals. I work to repair ruptures when I create them inadvertently. And (shocker?) I also see merit in some pressure/release methods and try to use an integrative approach that marries all of the above. I’ve noticed that articles about positive reinforcement that caution about pressure/release methods often seem to imply that people are damaging their animals if they are using anything but +R. In some people, this can lead to shame, guilt, despair and an impulse to give up or hide what methods people are using out of fear of being judged should they be “found out”. 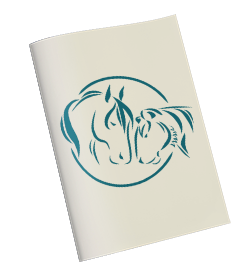 This is not the goal of these resources, of course, which are written with the intention of improving the welfare of horses and educating horse owners about learning theory, psychology, stress responses and a different way of shaping behaviours and improving the quality of the horse-human relationship. However, guilt, shame and discouragement can occur nonetheless, similar to how resources promoting attachment parenting and co-sleeping can sometimes lead to guilt or shame in exhausted moms who turn to modified sleep training methods to get some much needed rest, or who bottle feed because of sore and bleeding breasts. And I’m a huge promoter of attachment- and trauma-informed parenting! Just as I am about knowing the science of things in general, especially human-animal interactions. I’m also practical and a shades of grey kind of person. Not all sleep training methods, just like not all negative reinforcement, are harmful and lead to overwhelm and shutdown. And clicker / target / +R trainers or coaches aren’t available everywhere (yet). In many places, the options are either A) different versions of traditional horsemanship methods in different disciplines that use coercion/dominance, or B) “natural horsemanship” and liberty work (Parelli or others who might not use the NH term who use negative reinforcement or various versions or combinations of gentling, -R, +R and liberty). There are more than these two categories, but it most commonly seems to come down to these two in many areas. Yet, articles that talk about the problems with NH seem to imply that “if you don’t switch to positive reinforcement, you’re doing it wrong”. Which also leads to the implication of “if you can’t do +R then you shouldn’t do anything at all.” It seems very black and white, divisive and polarizing. In psychology and psychotherapy, if one approach is touted as the best beyond all others, we’re taught to view that with critical thinking – no one approach is a panacea, and chances are high there is good to be taken from more than one source. Throwing out the baby with the bathwater is often misguided. So then what are people to do instead if there are no local trainers or accessible clinics for positive reinforcement? Yes, people can read books, there are some online training programs for clicker training, and there’s phone consultation. But positive reinforcement requires just as much nuance and skill to do properly as negative reinforcement methods do; exclusively relying on videos to learn anything isn’t as good as getting 1:1 help with a trainer in person with one’s own animals or attending a clinic, of course. The fact of the matter is that horse training is complex, some geographic regions don’t have a lot of options, and horse owners need to pragmatically deal with things as they arise as best as they can based on the financial and time constraints of their lives. Not everyone is going to be able to easily access positive reinforcement coaching or clinics. And not all humans are willing to keep horses that aren’t serving some purpose involving work/riding. 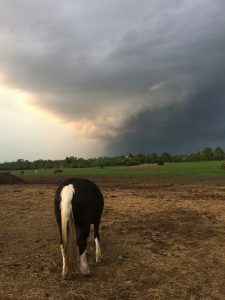 Feeling guilt or shame for when horsemanship methods backfire or have a negative impact on one’s horse and the relationship is normal, and these emotions are a part of learning and wanting to do better. 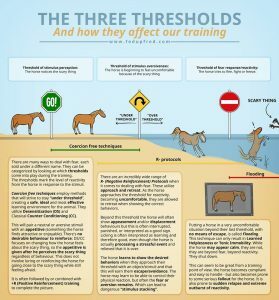 However, these can become toxic and lead to helplessness or defeat if other alternatives, or adaptations of traditional or NH methods, are not proposed when +R training isn’t readily available. And this isn’t typically addressed when I read articles about positive reinforcement. And inciting guilt and shame as a tool for learning goes against the basic tenets +R stands for. I understand “natural horsemanship” as a category of approaches has its share of issues. There are inaccuracies taught as fact in NH, and I cringe watching some of the videos knowing what I know about reading calming signals, displacement behaviours, and psychophysiology. There are things that NH has helped me and my horse with that have been beneficial for both of us, and there are things I do not like about it at all. It can be done improperly without skill or nuance. It can be done without an understanding of the nervous system and psychophysiology and attachment. And… for some, it is a far better option than what else is available. There are horses that do quite well with it who would otherwise not have had a chance. It can be done skillfully in ways that don’t lead to learned helplessness, flooding or shutdown. The reverse also happens. There are also inaccuracies taught as fact when discrediting pressure/release methods. Not all pressure/release is wrong or bad, just as not all stress is distress. There are modern horse training articles that still teach that the nervous system is either in a stress response or a relaxation response, and therefore that stress signals are a bad sign. Polyvagal theory shows that it is far more nuanced and interesting than that. That outdated nervous system view creates an unnecessary sense of panic or fear that people are automatically doing harm if using pressure/release. My compassion for the trauma piece brings me to wonder if some of the negative charge around pressure/release can, for some people, be linked to unresolved over-coupled activation around past trauma, such as programming and shame around bringing up one’s energy to engage in healthy fight responses that remain shut down in the nervous system. According to Peter Levine’s observations of trauma resolution in wild versus captive animals, increasing pressure to get a response can be healthy and necessary at times, providing a sense of biological completion and triumph over threat – something that even animals in the wild will use at varying levels of intensity when needed to defend themselves, set a boundary, teach youngsters, and so on (I differentiate between pressure as an aversive within certain thresholds, and outright punishment, violence and abuse). While Lucy Rees does say that conflict behaviours are up to 20 times more common in captivity than in the wild, where affiliative behaviours are more the norm, this does not mean there are no conflict behaviours at all. Ideally we aim for affiliation, and learn how to navigate stress when it occurs to build resilience, as opposed to avoid adversity altogether. Are some individuals who have coped to survive through playing nice / appeasement more likely to be drawn to positive reinforcement as a result of the activation they feel when bringing up their energy or intensity? Are some individuals who misuse negative reinforcement also carrying unresolved trauma and dysregulation that results in missing subtle cues, thresholds, and being too heavy-handed or coercive (which can become a traumatic re-enactment)? What about the impact of (in)secure attachment dynamics on the selection of training methods? In what ways can a trauma lens inform horsemanship, for the human and the equine? How can awareness and healing of what is happening inside lead to renegotiation, healing and optimal interactions on the outside? Interspecies dynamics are complex and nuanced, and I don’t know that science has adequately researched these factors yet. All this to say that I agree with the intention of the IAABC article. It’s not a full review, but a start. I look forward to other articles and research that offer an unbiased, unemotional review of this complex matter. We have to find a way to balance science with being practical. Inducing guilt or shame to get people to change their ways backfires and can lead to helplessness when no other practical options are available. Instead, I would love to see some guidelines/tips for folks who will be continuing to use NH (cause that’s a huge market and NH isn’t going away any time soon) to adapt those methods based on accurate neuroscience, attachment, and nervous system responses. A mid-range option, beyond ideas of righting and wrongdoing. I would be interested in co-authoring something to bring in the psychophysiology part if someone can bring the horse training part. One of the trauma-informed principles is collaboration, and I love opportunities where we can come together and learn from one another. And that field Rumi speaks of? 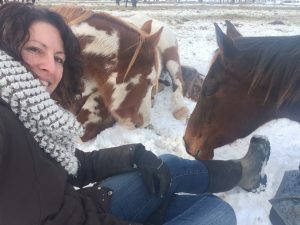 I personally like to think of it as a huge pasture where horses can live securely knowing they have humans who are doing the best they can to do right by them. Let’s keep finding ways to grow the edges of that field by inviting curiosity through thoughtful questions, inquiry, and integration of best practices in horsemanship.